1. Launch Visual Basic 2005 from the Start menu and choose File, New Project from the main menu. Choose to make a new Windows Application and select a project name of Flying Thingies. Press OK to make the project. Your project is made up of more than one file - in fact there a lot of files and folders that will need to be saved. You will need to take care with this. 2. To save your project, click on File, Save All on the menu. You should get a box like this. If you have the Create Directory For Solution box checked, VB will create a folder for you in which all of the relevant files can be stored. 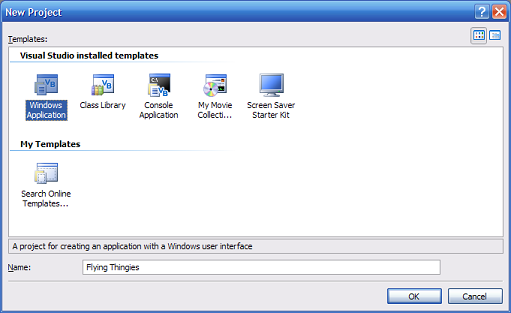 Make sure that you select a folder in your user area and that you have named the project and click on the Save button. Now you can save your entire project by clicking on File, Save All on the main menu. When you need to open up a project that you have been working on , you will need to open the .sln file in the folder that you have created. 3. Now you are ready to start making your first program. In the centre of the screen, you should be able to see the form that was automatically created for your program. If you can't, double click on form1.vb in the Solution Explorer window. This form is the window that your program will run in. The first thing to change is the text in the form's title bar. Look in the properties window and scroll down until you find the property called text. Change it so that it says Flying Thingies and press enter. Your text should now appear in the title bar of the form. 4. Resize the form by dragging with the mouse. You will need your form to be at least half as large as the screen you are working with. 5. Look through the toolbox on the left of the screen until you find Picture Box. Click on this and draw a small picture box (about 75 pixels square) in the centre of the form. In the properties window, change the name of the picture box to picThingy and the SizeMode to Autosize. 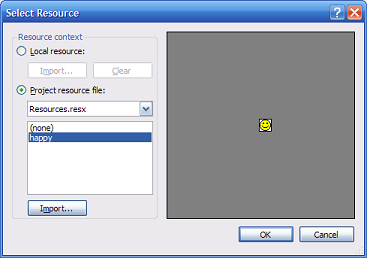 Select to import a resource and choose an appropriate image for the picture box. Click OK and see how you have placed your picture on the form. 7. Now to animate the picture. Locate and select a timer control from the toolbox. Click on the form to add a timer. Change the name of the timer to tmrMove and set its interval to 10 and make sure that its enabled property is set to true and the GenerateMember property is also set to true. Add the following line of code in between these lines. Each time that the timer ticks, this line of code subtracts 1 pixel from the picture's top property. The top property is the distance in pixels that an object is from the top of the form. 9. Now to test the program for the first time. Press F5 to start the debugger. The picture should glide gracefully up the screen and disappear at the top of the form. We should sort this out. 10. Stop the program by closing its window. Change the code that you wrote to that shown below. The following lines of code check the position of the picture and, if the top property is less than 0 (above the top of the form), the top property to be equal to the height of the form. Notice that the word Me is used to refer to the form. Run the program again and enjoy the way that your picture flies off the top of the form and comes back at the bottom. Save your work and run the program again. Monkey about with the scrollbar and delight in the adjustability of your program. You have now completed a very basic program. Remind yourself of what you have learned and read through the code that you wrote. Now to consider some additions to the program. You could add another picture box to the form with a different picture. It will need a different name like picThingy2. You will also need to add some lines of code to make sure that this new picture is also moved when the timer ticks. Your pictures have been flying up or down the form because we have been adjusting the top property of the picture. Controls also have a left property that indicates the distance that the control is from the left of the form. If you add another picture and write code that adds or subtracts 1 from this property each time the timer ticks, your picture will move horizontally. If you subtract from this property, it will eventually become equal to 0. If it is less than zero, you will have to make it equal to the width of the form if you want it to reappear at the right of the form when it flies off the left. To move diagonally, you need to adjust the top and left of the picture. Try it.